Faithful readers of this blog already know about Derrick Campana ’01, so you’ll be pleased to see that he not only made it into the magazine, but snagged our cover—with a little help from Petey. Campana has carved out a niche for himself in the field of orthotics for animals—mostly pets, but some wild animals, too. Learn about his story and how a chance meeting led to a brand-new career field. Also in this issue: One of the greatest sportsmen of his day, Steve Hamas has been relegated largely to Penn State boxing lore. Learn about the versatile athlete who played in the nascent NFL and beat former world heavyweight champion Max Schmeling in the ring. We also feature poems and photos from Pennsylvania’s fracking fields, as documented by two Penn State professors who recently published the book Shale Play: Poems and Photographs from the Fracking Fields. Also inside: Meet Rhea Sullivan, a former THON fundraiser-turned-medical student who’s hoping to make a breakthrough in the fight against cancer; catch up with swimmer Nikolette Nolte, whose own battle against cancer has inspired the social media hashtag #NikiStrong; find out former hoops star John Amaechi’s favorite spot on campus; and discover the Penn State connection to the Philadelphia Flyers’ new mascot, Gritty. All that and more in our March/April issue. Our November/December issue reunites us with Nittany Lion legend Curt Warner ’83 and previews his forthcoming book—written with his wife, Ana—which shares their story of raising a family that includes twin sons diagnosed with severe autism. Their collaborator calls it a “blisteringly honest” look at the challenges they’ve faced, but also one that’s very much a love story. The Warner Boys: Our Family’s Story of Autism and Hope is due out December 1, but available for pre-order now; you can read our feature on the Warner family starting on p. 40. We’ll also take you into the School of Music’s brand new recital hall, with a look at how the building, and the school, have evolved to offer opportunities in both music performance and pedagogy, and how its new director hopes to expand the curriculum. The music starts on p. 48. Plus, we asked for memories of your favorite classes, and gathered some of the best tales of life-changing—and in some cases energy-sapping—courses and professors. Those stories kick off our features, starting on p. 32. You’ll also meet a Smeal senior who uses a 3D printer to create customized shoes (p. 16); get to know the alum in the viral photo running with the bulls in Pamplona in a Saquon Barkley jersey (p. 61); and meet the newlywed Nittany Lion couple already with multiple NCAA titles: women’s soccer captain Maddie Elliston and wrestler Jason Nolf (p. 28). It’s all in our November/December issue, arriving in mailboxes soon. If you’ve been in Rec Hall, you’ve probably seen the plaque honoring the first Penn State athletes to die in combat in World War I—Levi Lamb ‘1915 and James “Red” Bebout ‘1914. Lamb, the first to fall, was killed in the French countryside in the second Battle of the Marne; he was further honored as the namesake of the annual fund that supports athletic scholarships at Penn State. 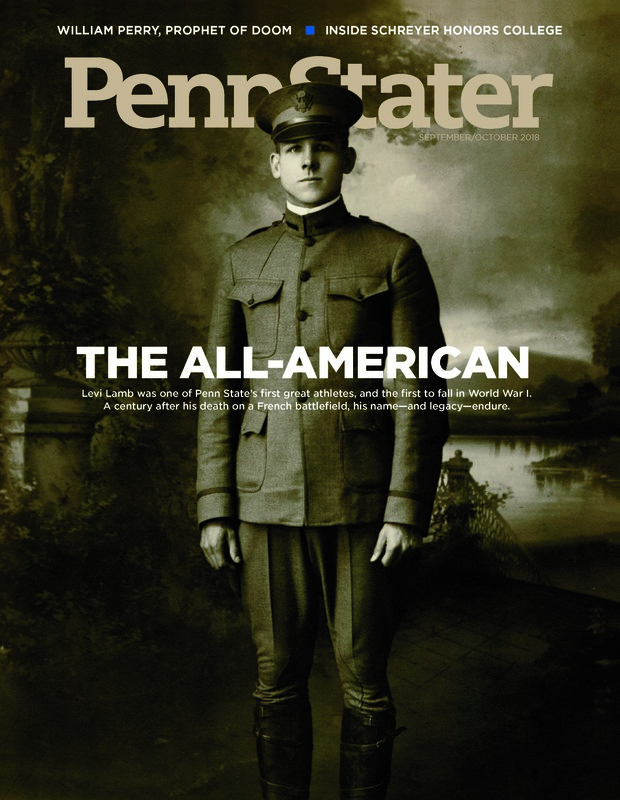 For our September/October cover story, Ken Hickman ’98, director of the Penn State All-Sports Museum, takes you into Lamb’s life and how the talented athlete arrived at Penn State and became the school’s first three-sport letterman before fulfilling a sense of duty to fight on the front lines. Lamb’s story begins on p. 30. Also in this issue, Schreyer Honors College Dean Peggy Johnson reflects on her first year on the job, the Scholar experience on campus, how the college competes with the Ivy League, and her plans for leading the college into the future. On the heels of the Honors College’s 20th anniversary, Johnson sits down for an up-close Q&A, which begins on p. 38. And former U.S. defense secretary William Perry ’57g is on a mission to educate millennials—and anyone else who will listen—on the perils of the nuclear threat. That story starts on p. 46. Plus, get a few tips on learning a new language, meet State College’s pinball hobbyist (don’t call him a collector), and find out how junior running back Miles Sanders is ready to become the new focal point of the Nittany Lion ground game—and filling some very big shoes. It’s all in out Sept./Oct. issue, arriving in mailboxes soon. But before you come to that, get to know the woman behind the icy stare that greets you on our cover. Rebecca Maine is a Golden Gloves state champ and Olympic boxing hopeful. She’s also an all-conference cross country runner at Penn State DuBois, not to mention a dean’s-list student. But she’s also a recovering addict who recently celebrated five years of sobriety. Read how she overcame addiction and landed at Penn State. Her story, “A Fighter’s Chance,” starts on p. 28. Then venture with us to Antarctica. Editor Tina Hay ’83 led an expedition of Penn State Alumni to the polar ice cap, and captured most of the images you’ll find here. Learn about chinstrap and gentoo penguins and what it’s like to be surrounded by all that ice. “An Expedition to Antarctica” begins on p. 36. And find out how two of Penn State’s longest-serving deans have adapted to the evolving word of academia, what they’ve learned about themselves, their profession, and what lessons they’ll take with them into retirement. “Deans in Conversation” starts on p. 46. Plus, read of one Penn College professor’s goal of making the perfect croissant (p. 16), take a look at how the first We Are Weekend alumni reunion events unfolded (p. 61), and see how two alums have kept alive an amazing streak of getting in a round of golf every month for going on five years now (p. 24). It’s all in our July/August issue, arriving in mailboxes next week. Our May/June cover will no doubt rekindle some memories of Finals Week—when it sometimes felt like you’d never get out from under the pressures of studying. Others have different memories, whether it was because of scrambling to make it to the right room assignment or talking your way into a grade by visiting a professor’s office hours after the fact—or even because the week culminated with wedding bells following your last final—tales of finals week memories run the gamut. 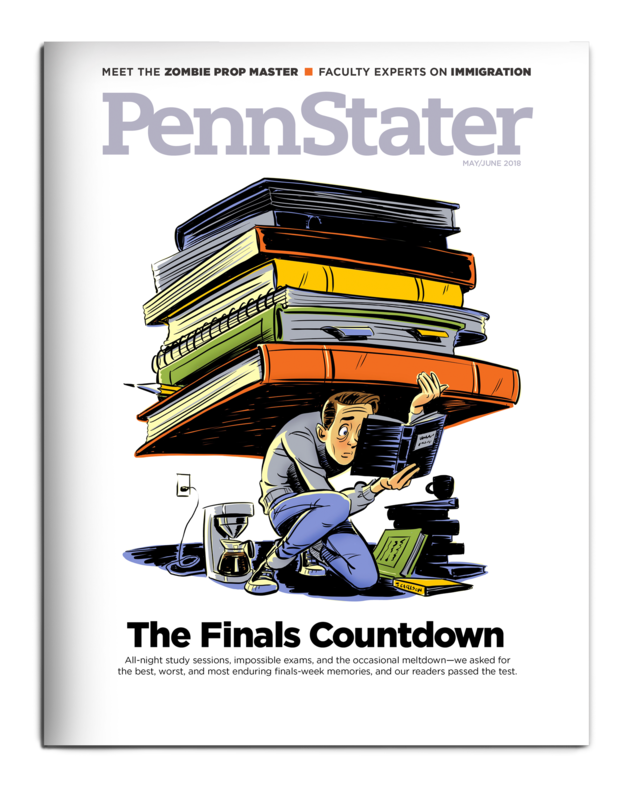 See how Penn Staters remember the experience in our collection of “Finals Week Memories,” starting on p. 54. Also in this issue, you’ll meet Gillian Albinski ’93, an alum who knows a thing or two about surviving a zombie apocalypse. See how this Penn Stater helps prop up The Walking Dead and more of your favorite shows in “The End of the World as She Knows It” (p. 46). And see how a dozen university experts frame “The Immigration Debate:” from political and ethical angles to health care and higher education concerns (p. 45). Plus see what lessons Penn State researchers are learning from a newly discovered coral reef in Colombia (p. 62), how wrestler Bo Nickal secured another NCAA championship for the Nittany Lions (p.26), and how a student is using art to overcome a disability—and gaining some national acclaim (p. 16). It’s all in our May/June 2018 issue, arriving in mailboxes soon. The “Club Hopping” feature in our March/April issue offers a brief glimpse inside the Penn State Ukulele Club. But a 75-word short didn’t seem to do it justice. The main draw of the club is the instrument itself: It’s easy to learn, and it’s fun to play. With just four string, the chords are simpler than a six-string guitar, and all the notes are of a higher pitch, which makes the sound gentler and more pleasant. After all, the instrument is probably most closely associated with a light island breeze on a Pacific Isle beach with a piña colada nearby.